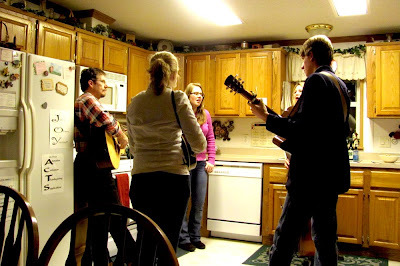 The “Big Adventurers” getting in some kitchen practice before our concerts. The Lord graciously provided five concerts in February for our family in relatively short notice. 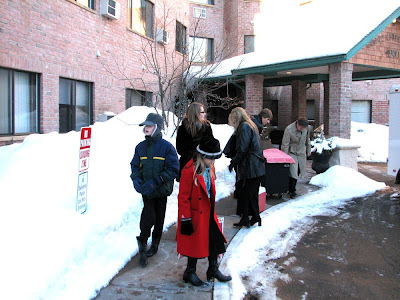 On February 2nd, we arose early and traveled toward the Twin Cities…Robbinsdale, MN, in fact. 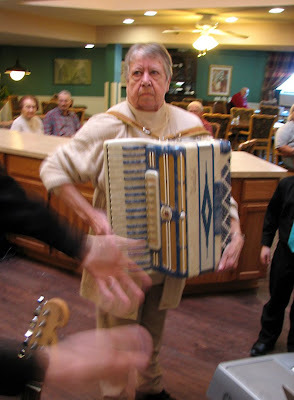 We were invited to sing at Copperfield Hill Senior Living, and we had a wonderful time with the sweet people there. It was the first time to do a normal, non-Christmas program since November, so it was interesting to get back into the swing of things. Allow me to explain this place for you a little. 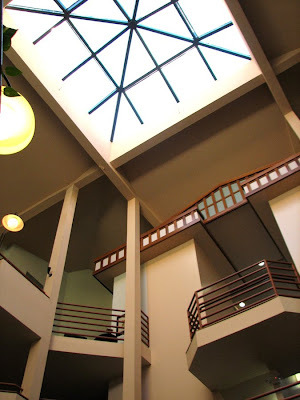 It is a five story building, and the room where we sang was open to four levels. A portion of the residents came down to our level, but some just pulled up chairs by the railings, watching us from up above. It was interesting to have an audience on either side, above us, and even behind us! It makes my neck sore to remember it. Also a highlight was having our Grandma Garms in the audience; her friend and ours, Teresa, was responsible for us going to Copperfield in the first place. 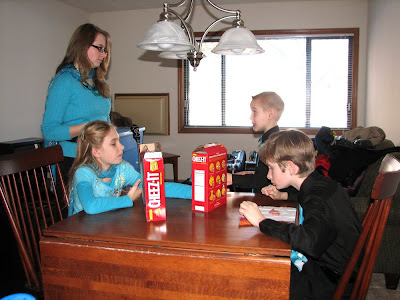 Leesha, Sam, Jayme, and Caleb snacking on some crackers in our “apartment” for the day (actually the room where we placed all our “stuff”). A familiar scene during our busy concert week-the Garms family loading, unloading, waiting for everything to be loaded, trying to look busy, and finally hitting the road. This picture will not make it as a CD cover, I assure you, unless for some strange reason we suddenly like ourselves in purple and red! 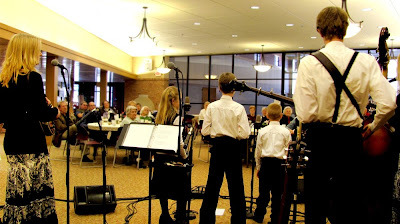 Shortly after on Friday, February 11th, the van and trailer traveled to Baxter, MN to sing at First Baptist Church for their Valentine’s Day Banquet. What fun we had! 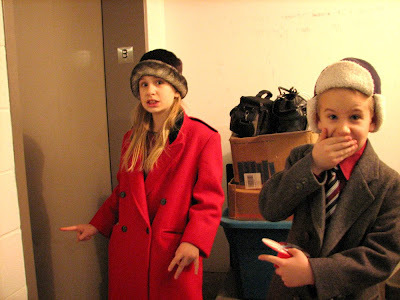 Caleb was especially in an unpredictable mood and kept us in stitches during the concert (like when he jumped off the stage with his guitar and harmonica and kept adding new things to his solo), and Sam, Mr. Spiritual Movement, could not keep still the entire night! We were very blessed and enjoyed getting to know Pastor Wayne and his wife Margie (whew, can they cook an awesome chicken kiev!) and all the wonderful, encouraging people who attended the concert. Mom, helping Dad do the usual soundcheck. 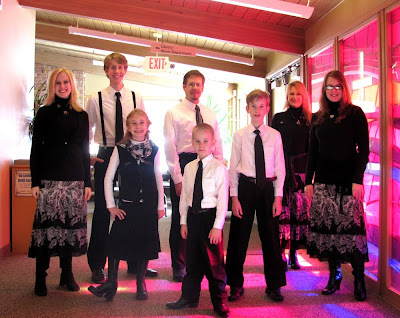 On Sunday night we sang at Milaca Evangelical Free Church in Milaca, MN, and it was like a step back into time. 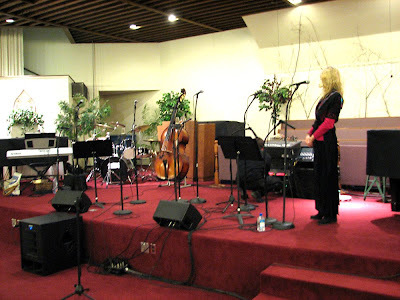 We had a concert there in June of 2009, the day after Ben’s graduation party (were we tired! ), and though it was significantly colder than June, everything was so familiar. As we began unloading the trailer, Ben and I were commenting on how much we have grown since our first concert there. Each practice session, each concert, and each mile traveled brings us further along in our growth. 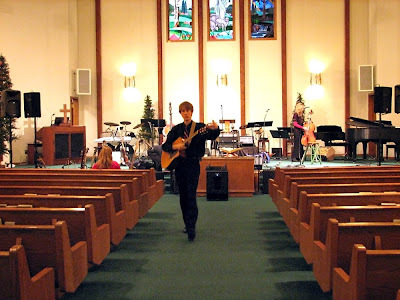 One of the best things about Milaca E. Free is their HUGE chancel area! We often are squished into some pretty tiny spots, so it was nice to have “moving” room! 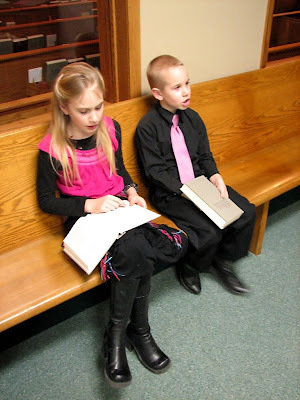 Jayme and Caleb singing out of the church’s hymnbooks. 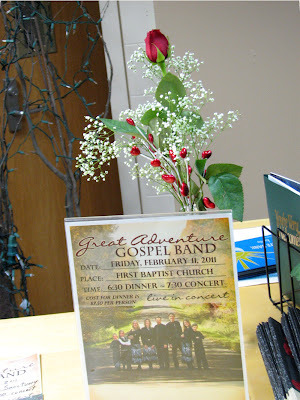 Our final concert was on February 14th-yes, Valentine’s Day itself. This concert was especially memorable for several things: Dad and Mom sang their first “love song” on stage and we got a ton of exercise! 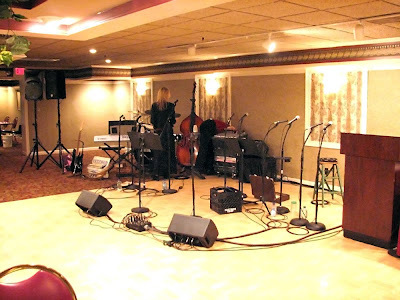 The banquet/get-together we sang for was in the basement of Tobies Restaurant in Hinckley, MN, and we had to maneuver through corridors and small doorways to get to the room, walk carefully around ice patches outside, make extra trips because of the interesting situation, and survive the elevator! Oh yes, I think this was one of our tightest areas to set-up in! Jayme especially was terrified of the noisy elevator! WHEW! There you have it! My mind is relieved having completed this blog…now I can move on to other things. I apologize for it’s extreme length; that’s what happens when you get behind! Come back soon for a number of exciting things!